Issues of identity and alternate, intimate and involuntary experiences of the body, as well as the telematic scaling of experience, are explored in recent performances. Technology is inserted and attached. The body is invaded, augmented and extended. Virtual-Actual interfaces enable the body to perform in electronic spaces. . What becomes important is not merely the body’s identity, but its connectivity- not its mobility or location, but its interface. The STOMACH SCULPTURE is an object inserted into the stomach cavity. It is actuated by a servo motor and a logic circuit tethered to a flexi-drive cable. It opens and closes, extends and retracts and has a flashing light and a beeping sound. The STIMBOD softrware makes possible the remote choreography of the body using a touch-screen interfaced muscle stimulation system. In the FRACTAL FLESH performance, people at the Pompidou Centre in Paris, the Media Lab in Helsinki and the Doors of Perception Conference in Amsterdam, were able to access and actuate the artist in Luxembourg. 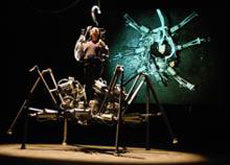 EXOSKELETON is a pneumatically powered six-legged walking machine actuated by arm gestures. HEXAPOD is a more compliant and flexible 6-legged walking robot and although it looks like an insect, it will walk like a dog. The EXTRA EAR is a proposed project to surgically construct an ear that if connected to a modem and wearable computer, becomes an internet antenna able to transmit real audio sounds to augment the local sounds it hears with its actual ears. EXTRA EAR- 1/4 SCALE is an small replica ear grown with human cells. A partial life entity awaiting prosthetic attachment to the body. MOVATAR is an inverse motion capture system – an intelligent avatar that will be able to perform in the real world by accessing and actuating a body, whereas in previous performances the artist has attached prosthetic devices to augment the body. Now the body itself becomes a prosthesis – possessed by an avatar to perform in the physical world. And PROSTHETIC HEAD is an embodied conversational agent that speaks to the person who interrogates It with real-time lip syncing and facial expressions. The body is an evolutionary architecture that operates and becomes aware in the world. To alter it’s architecture is to adjust it’s awareness. The body has always been a prosthetic body, one augmented by its instruments and machines. There has always been a danger of the body behaving involuntarily and of being conditioned automatically. A Zombie is a body that performs involuntarily, that does not have a mind of it’s own. A Cyborg is a human-machine system There has always been a fear of the involuntary and the automated. Of the Zombie and the Cyborg. But we fear what we have always been and what we have already become. As surface, skin was once the beginning of the world and simultaneously the boundary of the self. But now stretched, pierced and penetrated by technology, the skin is no longer the smooth and sensuous surface of a site or a screen. Skin no longer signifies closure. The rupture of surface and skin means the erasure of inner and outer. An artwork has been inserted inside the body. The Stomach Sculpture- constructed for the Fifth Australian Sculpture Triennale in Melbourne, whose theme was site-specific work- was inserted 40cm into the stomach cavity. Not as a prosthetic implant but as an aesthetic addition. The body is experienced as hollow with no meaningful distinctions between public, private and physiological spaces. The hollow body becomes a host, not for a self but simply for a sculpture. As interface, the skin is obsolete. The significance of the cyber may well reside in the act of the body shedding its skin. Subjectively, the body experiences itself as a more extruded system, rather than an enclosed structure. The self becomes situated beyond the skin. It is partly through this extrusion that the body becomes empty. But this emptiness is not through a lack but from the extrusion and extension of its capabilities, its new sensory antennae and its increasingly remote functioning. Consider a body that can extrude its awareness and action into other bodies or bits of bodies in other places. An alternate operational entity that is spatially distributed but electronically connected. A movement that you initiate in Melbourne would be displaced and manifested in another body in Rotterdam. A shifting, sliding awareness that is neither "all-here’ in this body nor "all-there" in those bodies. This is not about a fragmented body but a multiplicity of bodies and parts of bodies prompting and remotely guiding each other. This is not about master-slave control mechanisms but feedback-loops of alternate awareness, agency and of split physiology. Imagine one side of your body being remotely guided whilst the other side could collaborate with local agency. You watch a part of your body move but you have neither initiated it nor are you contracting your muscles to produce it. Imagine the consequences and advantages of being a split body with voltage-in, inducing the behaviour of a remote agent and voltage-out of your body to control peripheral devices. This would be a more complex and interesting body- not simply a single entity with one agency but one that would be a host for a multiplicity of remote and alien agents. Of different physiology and in varying locations. Consider a task begun by a body in one place, completed by another body in another place. Or the transmission and conditioning of a skill. The body not as a site of inscription but as a medium for the manifestation of remote agents. This physically split body may have one arm gesturing involuntarily (remotely actuated by an unknown agent), whilst the other arm is enhanced by an exoskeleton prosthesis to perform with exquisite skill and with extreme speed. A body capable of incorporating movement that from moment t o moment would be a pure machinic motion performed with neither memory nor desire…. What makes this possible is a touch-screen muscle stimulation system. A method has been developed that enables the body’s movements to be programmed by touching the muscle sites on the computer model. Orange flesh maps the possible stimulation sites whilst red flesh indicates the actuated muscle(s). The sequence of motions can be replayed continuously with its loop function. As well as choreography by pressing, it is possible to paste sequences together from a library of gesture icons. The system allows stimulation of the programmed movement for analysis and evaluation before transmission to actuate the body. At a lower stimulation level it is a body prompting system. At a higher stimulation level it is a body actuation system . This is not about remote-control of the body, but rather of constructing bodies with split physiology, operating with multiple agency. There would be actions without expectations. A two-way tele-Stimbod system would create a possessed and possessing body- a split physiology to collaborate and perform tasks remotely initiated and locally completed- at the same time in the one physiology. Such a Stimbod would be hollow body, a host body for the projection and performance of remote agents. Glove Anaethesia and Alien Hand are pathological conditions in which the patient experiences parts of their body as not there, as not their own, as not under their own control- an absence of physiology on the one hand and an absence of agency on the other. In a Stimbod not only would it possess a split physiology but it would experience parts of itself as automated, absent and alien. The problem would no longer be possessing a split personality, but rather a split physicality. In our Platonic, Cartesian and Freudian pasts these might have been considered pathological and in our Foucauldian present we focus on inscription and control of the body. But in the terrain of cyber complexity that we now inhabit the inadequacy and the obsolescence of the ego-agent driven biological body cannot be more apparent. A transition from psycho-body to cyber system becomes necessary to function effectively and intuitively in remote spaces, speeded-up situations and complex technological terrains. Can a body cope with experiences of extreme absence and alien action without becoming overcome by outmoded metaphysical fears and obsessions of individuality and free agency? A Stimbod would thus need to experience its actuality neither all-present-in this-body, nor all-present-in-that-body, but partly-here and projected-partly-there. An operational system of spatially distributed but electronically interfaced clusters of bodies ebbing and flowing in awareness, augmented by alternate and alien agency. A customized search engine was constucted that scans, selects and displays images to the body- which functions in an interactive video field. Analyses of the JPEG files provide data that is mapped to the body via the muscle stimulation system. There is optical and electrical input into the body. The images that you see are the images that move you . Consider the body’s vision, augmented and adjusted to a parallel virtuality which increases in intensity to compensate for the twilight of the real world. Imagine the search engine selecting images of the body off the WWW, constructing a metabody that in turn moves the physical body. Representations of the body actuate the body’s physiology.The resulting motion is mirrored in a VRML space at the performance site and also uploaded to a Web site as potential and recursive source images for body reactivation. RealAudio sound is inserted into sampled body signals and sounds generated by pressure, proximity, flexion and accelerometer sensors. The body’s physicality provides feedback loops of interactive neurons, nerve endings, muscles, transducers and Third Hand mechanism. The system electronically extends the body’s optical and operational parameters beyond its cyborg augmentation of its Third Hand and other peripheral devices. The prosthesis of the Third Hand is counterpointed by the prosthesis of the search engine software code. Plugged-in, the body becomes a parasite sustained by an extended, external and virtual nervous system. A six-legged, pneumatically powered walking machine has been constructed for the body. The locomotor, with either ripple or tripod gait moves fowards, backwards, sideways and turns on the spot. It can also squat and lift by splaying or contracting its legs. The body is positioned on a turn-table, enabling it to rotate about its axis. It has an exoskeleton on its upper body and arms. The left arm is an extended arm with pneumatic manipulator having 11 degrees-of- freedom. It is human-like in form but with additional functions. The fingers open and close , becoming multiple grippers. There is individual flexion of the fingers, with thumb and wrist rotation. The body actuates the walking machine by moving its arms. Different gestures make different motions- a translation of limb to leg motions. The body’s arms guide the choreography of the locomotor’s movements and thus compose the cacophony of pneumatic and mechanical and sensor modulated sounds. What is explored is a walking architecture that exploits gravity and the intrinsic dynamics of the machine to generate dynamic locomotion. By shifting body weight and twisting and turning the torso, it is possible to initiate walking, change the mode of locomotion, modulate the speed and rhythm and change its direction. The body becomes the body of the machine. The machine legs become the extended legs of the body. It is a more intuitive and interactive system that does not function through intelligence but rather because of its architecture. It is a more compliant and flexible mechanism. It looks like an insect but walks like a dog- with dynamic locomotion. Hopefully, this hybrid human-machine operation will initiate alternate kinds of choreography. It is 5 metres in diameter and weighs about 250 kgms. The fluidic rubber muscle actuators eliminated problems of friction and fatigue that was a problem in the previous mechanical system of the Hexapod robot. The rubber muscles contract when inflated and extend when exhausted. This results in a more reliable and robust engineering design. The body stands on the ground within the chassis of the machine, which incorporates a lower body exoskeleton connecting it to the robot. Encoders on the hip joints provides the data that will allow the human controller to move and direct the machine as well as vary the speed at which it will travel. The action of the human operator lifting a leg lifts the three alternate machine legs and swings them forward. By turning its torso, the body makes the machine walk in the direction it is facing. Thus the interface and interaction is more direct, allowing an intuitive human-machine choreography. The walking system, with attached accelerometer sensors generates data that is converted to sounds that augment the acoustical pneumatics and machine mechanism operation. Once the machine is in motion, it is no longer applicable to ask whether the human or machine is in control as they become fully integrated and move as one. The 6-legged robot both extends the body and transforms its bipedal gait into a 6-legged insect-like movement. The appearance and movement of the machine legs are both limb-like and wing-like motion. Having developed a Third Hand, consider the possibility of constructing an extra ear, positioned next to the real ear. A laser scan was done to create a 3D simulation of the Extra Ear in place. Although the chosen position is in front of and beside the right ear, this may not be the surest and safest place anatomically to position it. Alternatively, the ear could be constructed on the forearm and repositioned later. But this would also require microsurgery to guarantee blood flow. Rather than the hardware prosthesis of a mechanical hand ,the Extra Ear would be a soft augmentation, mimicking the actual ear in shape and structure, but having different functions. Imagine an ear that cannot hear but rather can emit noises. Implanted with a sound chip and a proximity sensor, the ear would speak to anyone who would get close to it. Perhaps, the ultimate aim would be for the Extra Ear to whisper sweet nothings to the other ear. Or imagine the Extra Ear as an internet antennae able to amplify RealAudio sounds to augment the local sounds heard by the actual ears. The ear is not only an organ of hearing but also an organ of balance. To have an extra ear points to more than visual and anatomical excess. It also points to a re-orientation of the body. With the assistance of Oron Catts and Ionat Zurr of the Tissure Art & Culture Project, Symbiotica and a German Lab a 1/4 scale replica of my ear was grown using human cells. It was exhibited at Galerija Kapelica in Ljubljana in May, 2003. The ear was cultured in a micro-gravity bioreactor and was fed nutrients every 3-4 days. It is planned that the cartilage underpinnings of an ear would be grown using my bone-marrow cells and then implanted beneath the skin of the forearm. This would result initially in only a relief of an ear, but with the cutting and lifting of the ear flap and the construction of an ear lobe a 3D ear would be structured on the arm. This would only require the assistance of a cosmetic surgeon, making it more possible to realize. Other 1/4 Scale replicas of my ear were grown for the Clemenger Contemporary Art Award at the Ian Potter, NGV in Melbourne (using mouse cells) and for the National Review of Live Arts, The Powerstation, Midland (using the He La cell line). The concern is not with the pathological and the monstrous, but with alternate anatomical architectures. A body part is replicated, relocated and reattached in another place. The 1/4 Scale Ear is a partial life form awaiting to become a prosthetic part of the body. Consider a computer entity, a virtual body or an avatar that can access a physical body, actuating it to perform in the real world. If the avatar is imbued with an artificial intelligence, becoming increasingly autonomous and unpredictable, then it would be an AL (Artificial Life) form performing with a human body in physical space. With an appropriate visual software interface and muscle stimulation system this would be possible. The avatar would become a Movatar. And with appropriate feedback loops from the real world it would be able to respond and perform in more complex and compelling ways. The Movatar would be able not only to act , but also to express its emotions by appropriating the facial muscles of the its physical body. As a VRML entity it could be logged-into from anywhere- to allow your body to be accessed and acted upon. Or, from its perspective, the Movatar could perform anywhere in the real world, at anytime with a multiplicity of physical bodies in diverse situatons and remote locations. The aim was to construct an automated, animated and reasonably informed if not intelligent artificial head that speaks to the person who interrogates it. The PROSTHETIC HEAD project is a 3D avatar head that has real-time lip synching, speech synthesis and facial expressions. Head nods, head tilts and head turns as well as changing eye gaze contribute to the personality of the agent and the non-verbal cues it can provide. The Embodied Conversational Agents (ECA’s) are about communicative behavior. With a vision or sensor system, The Prosthetic Head will also be able to acknowledge the presence and position of the physical body that approaches it. And eventually be able to analyze the user’s tone of voice and emotional state. The ECA will be a much more seductive agent when it can compliment you on the color of your clothing and comment on the smirk on your face. Notions of intelligence, awareness, identity, agency and embodiment become problematic. Just as a physical body has been exposed as inadequate, empty and involuntary, so simultaneously the ECA becomes seductive with it’s uncanny simulation of real-time recognition and response. Initially I had to make decisions about it’s data-base and whether it would be a pathological, philosophical or flirting head. In recent years I’ve had an increasing amount of PhD students requesting interviews to assist in writing their thesis. Now I can reply that although I’m too busy to answer them, it would be possible for them to interview my head instead. A problem would arise though when the Prosthetic head increases it’s data-base, becoming more informed and autonomous in it’s responses. I would then no longer be able to take full responsibility for what my head says. The Partial Head project has developed from completing the Prosthetic Head and the Extra Ear- 1/4 Scale. The aim now is to not only grow an ear, but also small replicas of the artist’s mouth, nose and eye using primate cells. This will be a partial portrait, partially living but not quite yet human. That is it is human in form but primate in substance. These facial architectures will be grown over polymer scaffolds, in a cluster, contained within a self-sustaining drip system of nutrients within an incubator. 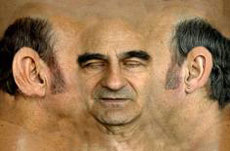 A micro camera will monitor the growing facial features and the image is both projected in the space and uploaded to a website. A digital counter indicates the number of growing cells. Whereas the Prosthetic Head can be seen as an interactive digital portrait, the Partial Head is a biotech but partial portrait of the artist. A face in fragments. The MUSCLE STIMULATION SYSTEM circuitry was designed by Bio-Electronics, Logitronics and Rainer Linz in Melbourne with the box fabricated by Jason Patterson. The graphical interface was done by Troy Innocent at Empire Ridge with the assistance of Tim Ryan. The STOMACH SCULPTURE was constructed by Jason Patterson in Melbourne. The FRACTAL FLESH, PING BODY and PARASITE software was developed by Gary Zebington, Dmitri Aronov and the Merlin group in Sydney. EXOSKELETON was completed by F18 as part of Stelarc’s residency in Hamburg City, coordinated by Eva Diegritz from Kampnagel. Jason Patterson constructed the EXTENDED ARM manipulator. F18 in Hamburg constructed the MOTION PROSTHESIS. Rainer Linz, Damien Everett and Gary Zebington developed MOVATAR. HEXAPOD is a collaboration between the Digital Reseach Unit, Nottingham Trent University and the Evolutionary and Adaptive Systems Group, COGS at Sussex University. The project team included Barry Smith (Project Coordinator), Inman Harvey (Robot Designer), John Luxton (Engineer) and Sophia Lycouris (Choreographer). With the MUSCLE MACHINE Dr. Philip Breedon (FaCCT, TNTU) was the Development and Project Manager, and Stan Wijnans (DRU, TNTU) developed the sensor technology with V2 and did the sound design. This second stage of the project was funded by the AHRB, the UK. The first performances in London were done at Gallery 291 on the 1st June, 2003. The 1/4 SCALE EXTRA EAR was a collaboration with TC&A (Oron Catts and Ionat Zurr of SymbioticA). THE PROSTHETIC HEAD was done with the assistance of Karen Marcelo, Sam Trychin and Barrett Fox from SF. Rainer Linz produced the STELARC (amplifed body) and FRACTAL FLESH (internet performances) audio CD’s. The HUMANOID audio CD was a collaboration with Chris Coe (Digital Primate) and Rainer Linz (Ontological Oscillators). 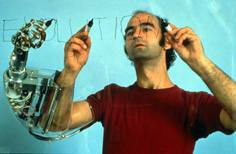 Gary Zebington is the Webmaster for Stelarc’s site. Also: Handswriting: Writing One Word With Three Hands Simultaneously Photographer: Keisuke Oki. 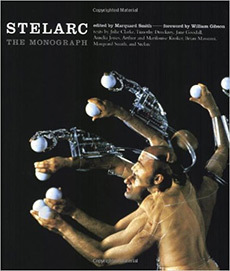 Stelarc is a Performance artist, a Visiting Professor at the School of Art and Design of The Nottingham Trent University, Nottingham, UK and an Adjunct Professor at the School of Contemporary Art of Edith Cowan University, Perth, Australia.